Let’s face it, as managers, we all wish we could make assignments and delegate tasks and not have to worry whether things are getting done. The reality–however–is that we all need reminders. Although we want our employees and staff to feel like they are trusted, it is far too easy to be in the middle of something and then get distracted with the next fire that must be put out. Amid trying to happily satisfy customer orders, a manager is dealing with employees not showing up to work, trying to reshuffle the schedule, ensuring there is enough inventory, and thinking about the customer who called to complain on the phone that is on hold. Ronald Reagan used to say “Trust, but verify.” I think this advice applies well in the workplace. Just because you verify something got done, doesn’t mean you don’t trust someone. It is good business practice and something that we should all do. It’s like having a safety net to ensure that the critical tasks are getting completed. After all, we have a business to run and if a deadline is missed, or inventory is not ordered, or the bathroom did not get cleaned, it can mean lost revenue. When it comes to assignments falling through the cracks, we can’t put all the blame on the employee. In fact, if you do, you’ll end up pushing people away. Managers need to take responsibility of ensuring that what is being asked of the employee is clearly communicated. Things may not get done the way you envisioned if the assignment or task is not understood. Therefore, it is good practice to give assignments with clear objectives so that they are understood and so that they clearly understand the expectations and the standards by which they are judged. A manager should provide adequate guidance and supervision with sufficient authority to accomplish the task or assignment. For a business, given the number of things we all must remember and the number of distractions we deal with daily, we need help in keeping things organized and focused on business results. As a manager, how do you get “mind share” with your employees when cell phones, gossip, texting, social media, smoke breaks, and meetings are all competing for your attention? 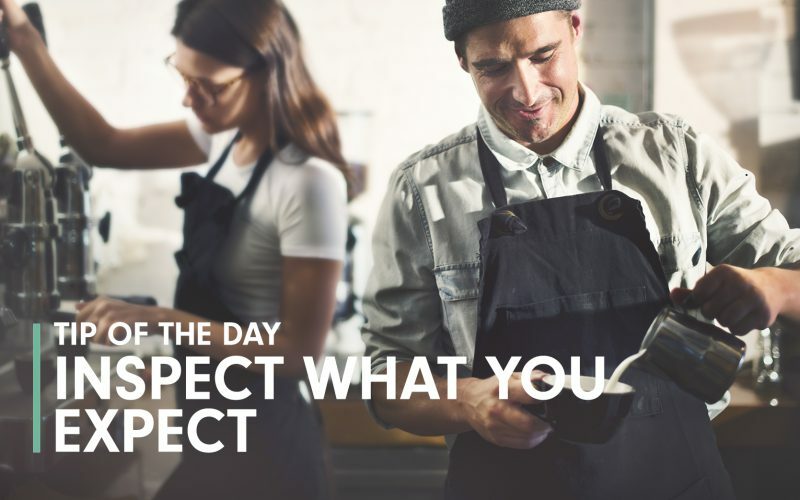 I believe the answer is in the adage, “inspect what you expect.” I’m not sure who came up with the phrase, but every manager should practice this principle if they want productivity and engagement with their employees. Here are some examples on how it can work. In a call center environment, without clear metrics to measure performance, you can get employees who spend their time leisurely trying to act busy to pass the time. I’ve seen this before where a company tracked the amount of phone time a sales rep spent on the phone as a key metric. That was the inspection. The result was that sales reps would talk with their family, friends, and other non-customers to drive the metric; however, it did not drive sales. The fix was to set an expectation that only calls to customers would be counted. With the new expectation and the inspection to go with it, sales improved. Another example is in a retail environment. A retailer was trying to improve their customer interaction experience. They had a loose process that everyone was trained on, but there was no inspection to ensure the process was followed. After working with Cambeo, the retailer put in an employee review process that measured the employee performance against the process. As a result, behaviors changed and the retailer started to see a change in employee behavior. Moreover, sales improved in the double digits and the culture improved dramatically. “Inspect what you expect” is a great tool for managers to help elevate performance and productivity. It is not an issue of trust, but an essential part of running an effective business. Clarity of expectations is important so that an employee knows exactly what is expected of them. Many employees turn to gossip or the talks at the water cooler over frustration because they get conflicting messages or poor communication from management. 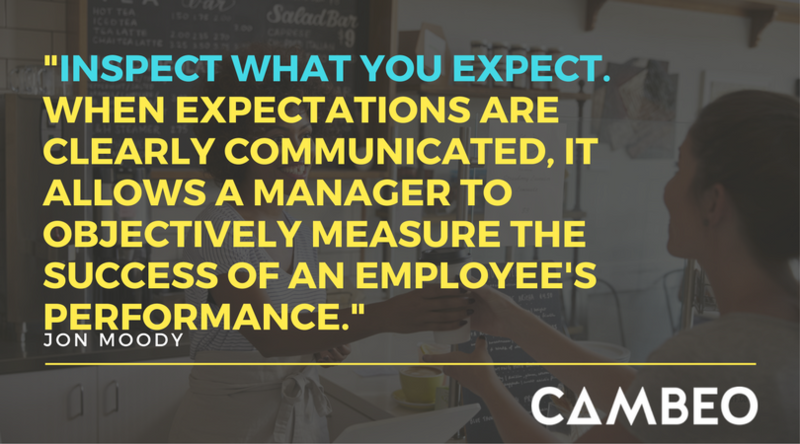 When expectations are clearly communicated, it allows a manager to objectively measure the success of an employee’s performance. No one wants to be judged on subjective material. Keeping things objective provides a better culture and accountability. When you “inspect what you expect,” your workers will respond better to your requests. You will also be able to better rate your employees on their performance. You will also gain their trust and focus if you recognize good work and treat all employees with fairness. The best way to treat everyone with fairness is to inspect all your direct reports with the same measuring stick. You can’t play favorites. Set clear rules and expectations and try your best to recognize everyone when good work is done. You’ll build a loyal team and a place where people will thrive and want to do their best. We’ve analyzed the data of thousands of employee reviews and created a basic Employee Review template with some of the best questions to measure and is a great way to “inspect what you expect.” Download it for free! Jon is the Senior Vice President of Sales and Business Development at Cambeo. Prior to coming to Cambeo, Jon worked at IBM in its Analytics Sales Unit managing a national sales team selling enterprise software to large enterprise accounts. Prior to IBM, Jon was the VP of Sales for BidSync, and Sales Leader at Microsoft.